The लॉस्ट Boys दीवार. a वॉलपेपर for "The लॉस्ट Boys" created द्वारा Dazia - found in her photobucket album. 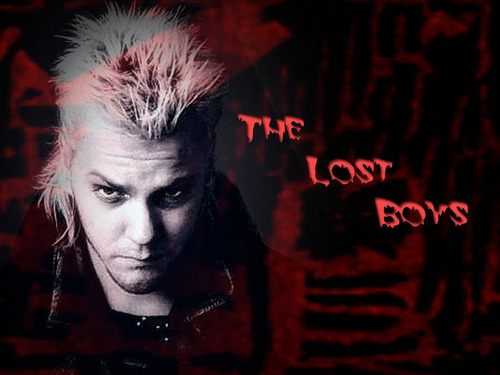 HD Wallpaper and background images in the The लॉस्ट Boys Movie club tagged: the lost boys movie vampires david kiefer fan art wallpaper dazia. Kiefer was great as a vampire! What's with a Frog liking a vampire though? ...must not be closely related to the brothers. Oh, wait! ...just noticed the sunglasses, and your motto. David was my fave vampire, but Sam was the reason i started watching Lb's. Gotta love them lost boys!! ...same here. Between my kids and I, the video got a fair amount of wear, and I recently bought (and watched) the DVD. It's definitely one of my favorite vampire movies. I've also got a large stand-up display that I bought from a video store when it first came to video. ...and a fairly faded t-shirt. lol!